I guess I would be stating the obvious if I said it’s been pretty hot lately? 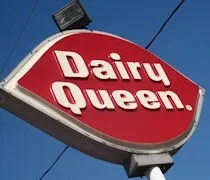 J and I were watching TV when a commercial for Dairy Queen popped up. The heat must have gotten to her because she all of a sudden really wanted DQ. I had to make a trip to the east side of town to meet some co-workers and drop something off. I took L along for the ride so that J could have 45 minutes or so to herself. After completing my task, J asked if I’d stop and pick up a couple Blizzards. I figured what the hell. It was hot and I like ice cream. 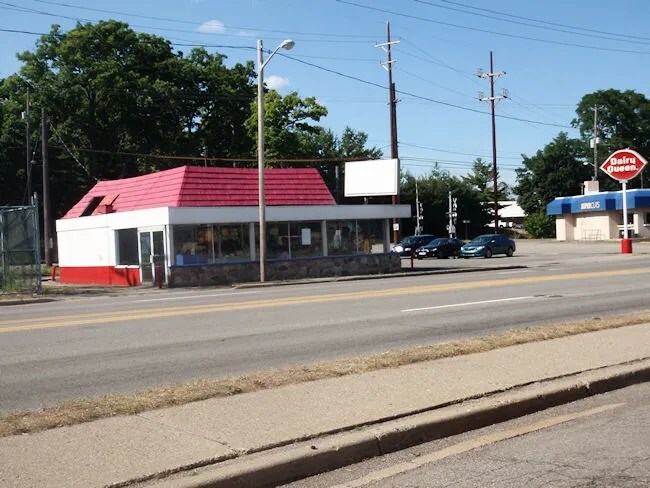 I stopped at the Dairy Queen on Michigan Avenue across the street from Waldo Stadium. That’s one of five DQ’s in the Kalamazoo area. The building is nothing to look at. It barely looks like there is still an operating business there. There are no signs on the building and it looks like no one has done any sort of maintenance work (like a coat of paint) on the building in quite some time. The inside is a carry-out only. There are no tables and only a bench to wait on while the food is prepared. I stepped up to the counter and was the only one in line. One of the two employees was standing right in front of me, but she had her back to me and never turned around. The other employee came out of a back room after a few minutes and saw me standing there. She came right up to the cash register to take the order. The order was pretty simple. 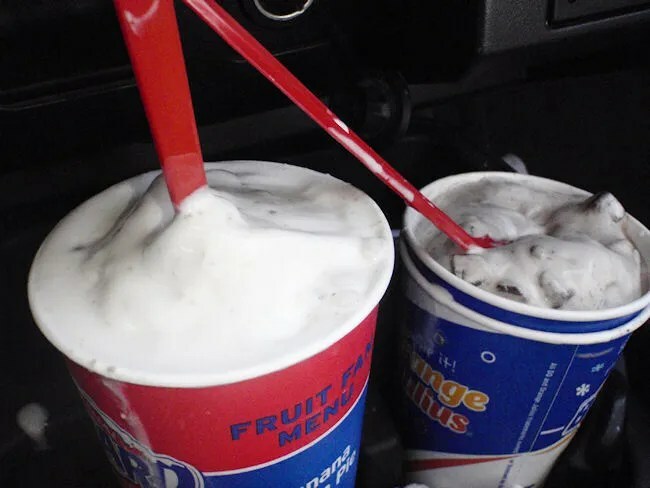 I got two Blizzards. I got a large cookie dough for myself and for J, I got a medium Chocolate Candy Shop which is the whole reason J wanted DQ in the first place. The cost was right around $10 for the two treats and it was only a few minutes of waiting before they were both put on the counter for me to take home. The soft serve ice cream didn’t do so well in the near 100 degree heat. I had quite mess in the car when I got home. Both cups were overflowing and melting. After cleaning up my truck and putting the Blizzards back in to the freezer for a few minutes to firm, up I greedily dug in my cookie dough concoction. 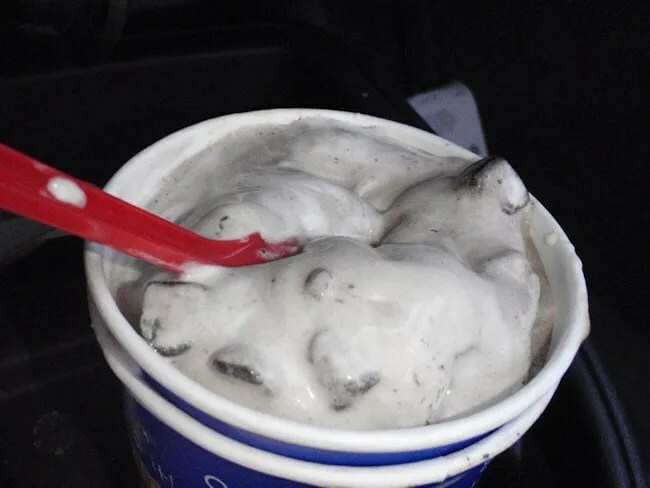 I almost always order either a Peanut Butter Cup or Oreo Cookie, but for some reason, I went with a flavor I haven’t had in years and it was yummy. J’s Blizzard is a special this month. It’s a candy assortment with different fillings (caramel, hazelnut cream and fudge) that’s blended with dark chocolate cocoa and vanilla ice cream. She seemed to like it and it helped take the edge off the heat. Dairy Queen brings back some many memories from my child hood that it’s hard to say anything bad about the place. It’s a little more expensive than some other places, but they always deliver exactly what I’m craving.